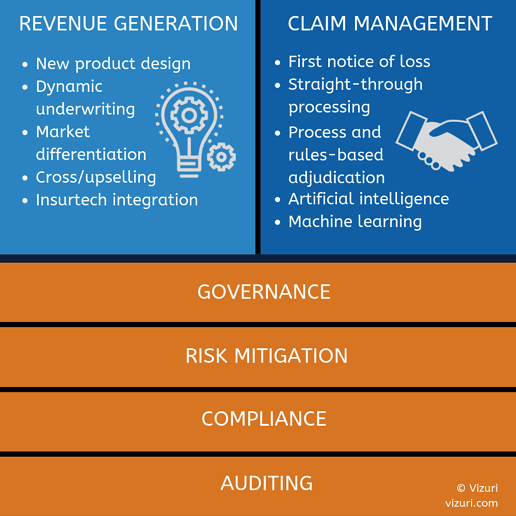 The situation that Vizuri constantly sees playing out in the insurance industry is where insurers are stuck with their legacy code and systems. These monolithic systems run on mid-range and mainframe computers. They use dated technologies that do not provide access to third-party information providers or leading-edge Insurtech technologies. They present an immense cost of modernization in terms of time, personnel, and money. However, insurers have started to recognize that these legacy systems are weighing them down with technical debt and preventing them from capitalizing on new market opportunities. Their systems have existed past the point of diminishing returns and it’s not worth investing further into maintaining dated systems that utilize legacy languages, databases, and architectures. Insurance CIOs face the dilemma of modernizing legacy policy administration systems and core services to keep pace with competitors while avoiding the disruption of existing services and day-to-day operations. These core services include policy administration (i.e. CRM), underwriting, billing, finance, quoting (i.e. risk selection, pricing), and claims processing. These services form the insurance company’s competitive edge, so to survive in a changing environment, insurers must focus on modernizing these core systems as they provide the potential to generate new revenue sources and help to control costs. What are the individual insurance business drivers impacting modernization efforts? Consumer preferences and demands are shifting the way insurance is marketed, underwritten, distributed, and serviced. This has caused the insurance industry to rush to innovate and prosper vs. stagnate and lose market share to new entrants and innovation leaders. In response to consumer demands, insurers are actively pursuing strategies for simplifying and automating insurance interactions along the whole customer experience from application to underwriting, rate selection, and claims processing to provide modern digital experiences. As a result, in our experience, most insurers focus their modernization efforts on these areas which are contained in insurance core services and provide the greatest return on investment due to new market penetration or reduced operational costs. Create new business lines and respond quickly to market/consumer changes. Increase top- and bottom-line profit by leveraging leading-edge technologies and third-party data providers that drive business value and consumer satisfaction. Efficiently manage the claims settlement process with minimal/managed risk. Turn data into knowlege that drives business strategy via data science that incorporates artificial intelligence (AI) and machine learning into capture and adjudication processes. An invisible but integral consideration in any modernization strategy should also be to alleviate the issues that prohibit innovation and lock the organization into proprietary legacy technologies. As mentioned earlier, a common problem is that companies feel stuck with their legacy code and systems. A future-forward modernization strategy should address this issue and minimize the chance of it happening again down the road. The strategy should also facilitate incremental modernization that does not require the company to pause for renovations. Therefore, insurers must make a choice that is difficult to fully inform. What approach should be taken to minimize disruption within the organization but that will still add the functionalities that will produce new revenue sources and cost control? Each option has tradeoffs that can affect technical and business operations. More importantly, each option sets a strategy for modernization that manages the tradeoff of time, cost, and business risk. In a perfect world, having a process or information system completely customized to your organization’s business requirements would be ideal, but this is not realistic. Businesses do not have the time, personnel, or resources for taking this approach, which also has the highest propensity for overruns in both time and cost. It is also the option that carries the most technical debt. What does this mean exactly? Insurers that create a fully customized system assume the entire opportunity cost for innovation as technology, industry, and consumer demands change. Custom-developed systems are time-and labor-intensive processes where insurers must develop a comprehensive plan for business agility, technology enhancements, and skills assimilation throughout their IT lifecycle. Beyond the resource investments it takes to develop a custom system in the first place, the opportunity cost of supporting, modifying, testing, and integrating it with existing systems will become largely your company’s responsibility. Sometimes, getting something off-the-shelf and paying any licensing fees is an easy price to pay for not having to maintain, enhance, add new functionality. “Fully custom” sounds great, but it will be heavy to implement and continually update as needed. By choosing this approach, you commit to paying potentially huge sums down the road in the form of technical debt. If your requirements can be met with a commercial off-the-shelf or SaaS product that already exists, then it makes sense to purchase it and integrate. So, if getting something off-the-shelf is going to solve the issue of technical debt, then the next logical place to look is at a piece of software that does it all, right? The answer isn’t quite yes. Choosing a cloud-based SaaS product is tempting for many organizations since these software platforms are ready “out-of-the-box,” offer a set pathway toward purported business goals, etc. But the simplicity they offer sacrifices choice. SaaS insurance products deliver centrally hosted applications over the Internet through a one-size-fits-all approach. This approach commoditizes the core functions that comprise the policy lifecycle. This sacrifices your innovative edge since you must conform to the vendor’s structured implementation. It also limits the ability to specialize functions and maintain competitive differentiation. If you can’t easily keep and wield the things that make you competitive—the knowledge and experience housed in your core insurance systems, then using this type of product could end up costing you anyway. It’s not just the loss of competitive edge that you stand to lose by going with a SaaS product for core insurance system modernization. You will be at the vendor’s mercy for changes, producing that same issue of being stuck. Conformance to their structure and schedule can stifle future innovation. Also, conformance to proprietary SaaS-based workflows bars entrance into markets that the vendor has not previously designed for or considered. Furthermore, even if your desired change is in the vendor’s product roadmap, it will take several weeks or months to be implemented, which may limit you from capturing new business or expanding within the insurance marketplace at a competitive speed. So, what if you customize your SaaS product yourself to make it perform like a custom solution? You end up reproducing your technical debt problem. Any customization that is applied to a base version of the SaaS application creates a specialized version that carries technical debt. Any customization performed against a previous version of the product must be reapplied to the next version, compounding the resource expenditure you sought to minimize by choosing a SaaS product in the first place. If these issues resonate, then a SaaS solution may just not be the right fit. That being said, a SaaS product may be right for your organization if you are able to adapt your current processes within the vendor’s framework and if you are using it to perform a standard function that doesn’t need to provide competitive differentiation. General and administrative (G&A) functions are prime candidates for core systems modernization utilizing SaaS-based systems. The functions of policy servicing (i.e. CRM), billing, and collections are also fine candidates for SaaS offerings. Specialization is what creates differentiated services and delivers value. Otherwise you are confining the proprietary elements that make you competitive to a vendor's framework. It’s easy to see why companies might want a fully custom solution, but as we discussed above, it’s actually less than ideal. On the opposite end, choosing a SaaS product sacrifices those proprietary elements. How can insurers with legacy systems, inflexible architecture, and pressure from next-generation competitors who use leading-edge solutions avoid these issues while incrementally improving their systems on their own schedules? The answer is to leverage technology for innovation, not operations. Use modern software architectures such as microservices to deliver innovation and provide incremental improvement for core systems modernization. The beauty of this approach is that the incremental steps toward modern functionalities are built in. In addition, these architectures can be combined and integrated with new cloud-based SaaS offerings, third-party data providers (e.g. DMV records, risk raters, MIB records, etc. ), and legacy systems. In this manner, modern software architectures become the foundation for a hybrid solution for incremental innovation. This hybrid design can gradually bring you valuable modernized core functions while not compromising your day-to-day activities. In the future, when you want to switch out individual system components for more modern ones that will keep you on the leading edge, this approach will make that easy. Vendor lock-in will cease to be a barrier. Meanwhile, you can build or buy any individual service or function that you want without having to worry about being stuck with it. Furthermore, by having the flexibility to combine individual services across multiple sources instead of committing to a single platform, you can invest fewer resources in developing and maintaining changes that suit your business. Modern software architectures pave the way for modernized core insurance functions because they provide the basis to pick and choose moving forward. The image below depicts an idealized version of this. It would not be possible without the agility of this approach. Modern software architectures put insurers in an ideal place to improve core insurance systems since those systems are also often informed by buried expertise from around the organization, such as in the heads of experienced underwriters. A microservices approach, for example, will provide the foundation to build upon the collective institutional knowledge of the organization, which must be managed and treated as a cornerstone in your transformational strategy planning. To find out more about setting up for insurance innovations, join us for our webinar with Forrester Principal Analyst Ellen Carney where we examine the state of commercial insurance and why it’s time to rethink legacy underwriting. Reach out to us any time with questions or meet us in person at Red Hat Summit on May 7-9 or at Digital Insurance on May 29-31.